Happy Ramnavami to all of you! 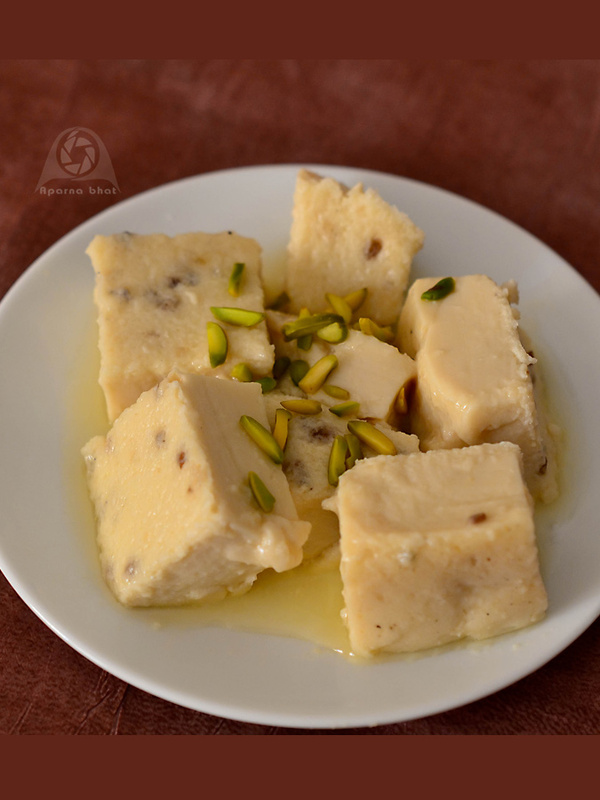 Posu, a special steamed pudding is a famous amchi delicacy prepared from thick milk of cow which we call as 'cheeka doodh' [meaning lactating cow's colostrum]. 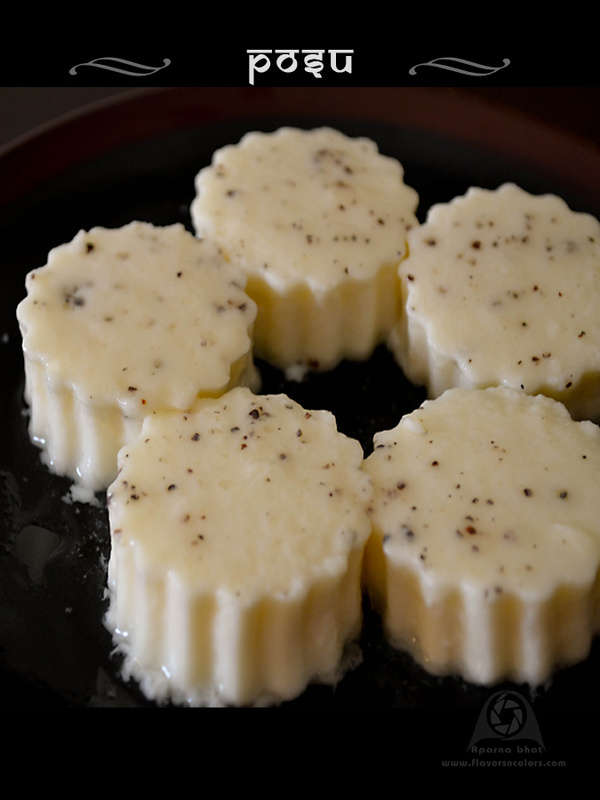 The pudding is known as Kharvas in Marathi, Ginnu in Kannada and Junnu in Telugu. An easily prepared dish either with sugar or jaggery, it was done at home in old days mostly when people owned cows/buffalos to meet the dairy needs of their joint family. This practice was commonly seen in native places or rural areas. The colostrum milk would make its appearance once in a while, few times in a year when the cow gave birth. First, the calves were taken care of with their feeds and the excess milk then used to prepare this delicacy. This milk is yellowish in color and very thick on first day. Gradually over next few days the consistency thins down. In cities, with trend of nuclear families and small apartments the tendency was to prefer dairy outlets in order to meet their daily demands of milk, yogurt, ghee, etc. [which is more practical than keeping a cow as pet ;)]. This all meant, to depend on the milkman who would arrive at doorsteps to sell the colostrum milk after the cow delivered a calf in his cow barn. Gradually, the number of cow barns reduced and this dish became a rare treat at home as well as my native place during my childhood days itself. I feel lucky at least to have tasted it. Chilled or hot both tastes yummy. After reaching Kuwait, I used to wonder if any dairy farm existed in this place as the general inclination was to buy fresh milk cans or tetra packs marketed by dairy companies/ dairy farms mostly from Saudi region. Now that I have read about existence of farms here, this special milk may be available but I never made an attempt to check for it. Thus, it's like ages we didn't have it and kids never tasted this fresh colostrum milk pudding. It's only last year during our India trip, I saw these packets [which you see in the below pic] placed on the shelves of one of the food joints in Bangalore. I thought to share this information with you all [if you are aware of these powder packets then go ahead and enjoy the pics]. These packets contain milk powder processed from thick milk and the pudding can be prepared at any time of the year. It gives similar results as the fresh colostrum milk. I was not at all surprised to find such an unique product as there has been so much of extensive research in food science as well as advancement seen in technology these days like molecular gastronomy,etc , infact the packets really turned out to be a boon for us. Now every vacation, this product tops "to bring items" list and I bring few packets along with me. Recipe wise the instructions are clearly mentioned on the packet itself. All you need is 100 gms of sugar or 150 gms of jaggery, little cardamom powder, 500 ml of raw/cold milk. Mix it well, stir in kamadhenu powder without lumps and pour in idli moulds/ cooker containers. Steam and cook in pressure cooker without weight/whistle for 10 -12 mins. Switch off the flame and allow it to cool. You can serve immediately or chill it before serving. ~In the first pic, the color of posu is white with use of sugar, where as its brownish in last pic due to use of jaggery. ~This product is vegetarian with a shelf life of 6 months and these packets are certified with food license. ~ I buy these packets from Sona's Kodial [Food joint] in Malleshwaram, Bangalore. My friends shared the information that these packets are also available in Shimoga [Distributors are from this place for State of Karnataka] and Mangalore Stores. 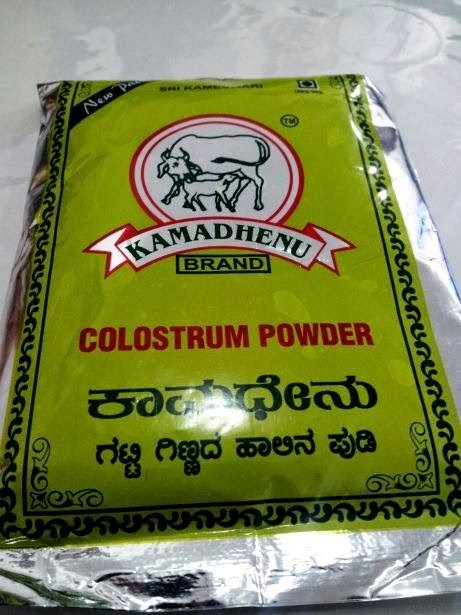 Am missing terribly this ginnu, omg, they do sell this colostrum in packets now. But who will get it for me from Bangalore, let me drool virtually here. I loved your write-up on the origin of this sweet.. very new to me and informative too.. Lovely pics as usual Aparna! Hi, thanks for sharing information on colostrum milk powder. Didn't know something like this existed, though I have visited Sona's Kodial a few time. Ginnu is a favorite at home. Will surely try this product next time. I too tried this after going thru' your blog..Thanks for the info..